In 1874, a group of artists called the Anonymous Society of Painters, Sculptors, Printmakers, etc. organized an exhibition in Paris that launched the movement called Impressionism. Its founding members included Claude Monet, Edgar Degas, and Camille Pissarro, among others. The group was unified only by its independence from the official annual Salon, for which a jury of artists from the Académie des Beaux-Arts selected artworks and awarded medals. The independent artists, despite their diverse approaches to painting, appeared to contemporaries as a group. While conservative critics panned their work for its unfinished, sketchlike appearance, more progressive writers praised it for its depiction of modern life. Edmond Duranty, for example, in his 1876 essay La Nouvelle Peinture (The New Painting), wrote of their depiction of contemporary subject matter in a suitably innovative style as a revolution in painting. The exhibiting collective avoided choosing a title that would imply a unified movement or school, although some of them subsequently adopted the name by which they would eventually be known, the Impressionists. Their work is recognized today for its modernity, embodied in its rejection of established styles, its incorporation of new technology and ideas, and its depiction of modern life. 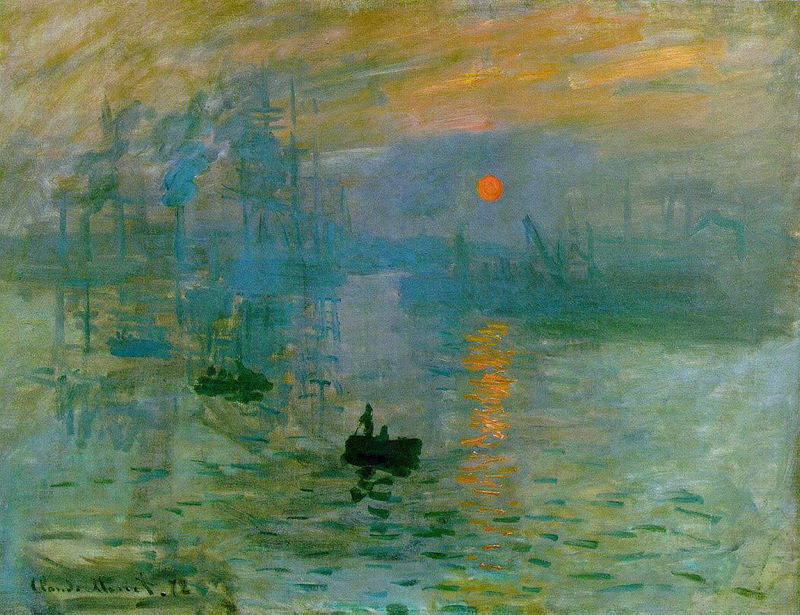 Claude Monet’s Impression, Sunrise (Musée Marmottan Monet, Paris) exhibited in 1874, gave the Impressionist movement its name when the critic Louis Leroy accused it of being a sketch or “impression,” not a finished painting. It demonstrates the techniques many of the independent artists adopted: short, broken brushstrokes that barely convey forms, pure unblended colors, and an emphasis on the effects of light. Rather than neutral white, grays, and blacks, Impressionists often rendered shadows and highlights in color. The artists’ loose brushwork gives an effect of spontaneity and effortlessness that masks their often carefully constructed compositions, such as in Alfred Sisley’s 1878 Allée of Chestnut Trees (1975.1.211). This seemingly casual style became widely accepted, even in the official Salon, as the new language with which to depict modern life. In addition to their radical technique, the bright colors of Impressionist canvases were shocking for eyes accustomed to the more sober colors of Academic painting. Many of the independent artists chose not to apply the thick golden varnish that painters customarily used to tone down their works. The paints themselves were more vivid as well. The nineteenth century saw the development of synthetic pigments for artists’ paints, providing vibrant shades of blue, green, and yellow that painters had never used before. Édouard Manet’s 1874 Boating (29.100.115), for example, features an expanse of the new Cerulean blue and synthetic ultramarine. Depicted in a radically cropped, Japanese-inspired composition, the fashionable boater and his companion embody modernity in their form, their subject matter, and the very materials used to paint them. Such images of suburban and rural leisure outside of Paris were a popular subject for the Impressionists, notably Monet and Pierre-Auguste Renoir. Several of them lived in the country for part or all of the year. New railway lines radiating out from the city made travel so convenient that Parisians virtually flooded into the countryside every weekend. While some of the Impressionists, such as Pissarro, focused on the daily life of local villagers in Pontoise, most preferred to depict the vacationers’ rural pastimes. The boating and bathing establishments that flourished in these regions became favorite motifs. In his 1869 La Grenouillère (29.100.112), for example, Monet’s characteristically loose painting style complements the leisure activities he portrays. Landscapes, which figure prominently in Impressionist art, were also brought up to date with innovative compositions, light effects, and use of color. Monet in particular emphasized the modernization of the landscape by including railways and factories, signs of encroaching industrialization that would have seemed inappropriate to the Barbizon artists of the previous generation. Perhaps the prime site of modernity in the late nineteenth century was the city of Paris itself, renovated between 1853 and 1870 under Emperor Napoleon III. His prefect, Baron Haussmann, laid the plans, tearing down old buildings to create more open space for a cleaner, safer city. Also contributing to its new look was the Siege of Paris during the Franco-Prussian War (1870–71), which required reconstructing the parts of the city that had been destroyed. Impressionists such as Pissarro and Gustave Caillebotte enthusiastically painted the renovated city, employing their new style to depict its wide boulevards, public gardens, and grand buildings. While some focused on the cityscapes, others turned their sights to the city’s inhabitants. The Paris population explosion after the Franco-Prussian War gave them a tremendous amount of material for their scenes of urban life. Characteristic of these scenes was the mixing of social classes that took place in public settings. Degas and Caillebotte focused on working people, including singers and dancers, as well as workmen. Others, including Berthe Morisot and Mary Cassatt, depicted the privileged classes. The Impressionists also painted new forms of leisure, including theatrical entertainment (such as Cassatt’s 1878 In the Loge [Museum of Fine Arts, Boston]), cafés, popular concerts, and dances. Taking an approach similar to Naturalist writers such as Émile Zola, the painters of urban scenes depicted fleeting yet typical moments in the lives of characters they observed. Caillebotte’s 1877 Paris Street, Rainy Day (Art Institute, Chicago) exemplifies how these artists abandoned sentimental depictions and explicit narratives, adopting instead a detached, objective view that merely suggests what is going on. The independent collective had a fluid membership over the course of the eight exhibitions it organized between 1874 and 1886, with the number of participating artists ranging from nine to thirty. Pissarro, the eldest, was the only artist who exhibited in all eight shows, while Morisot participated in seven. Ideas for an independent exhibition had been discussed as early as 1867, but the Franco-Prussian War intervened. The painter Frédéric Bazille, who had been leading the efforts, was killed in the war. Subsequent exhibitions were headed by different artists. Philosophical and political differences among the artists led to heated disputes and fractures, causing fluctuations in the contributors. The exhibitions even included the works of more conservative artists who simply refused to submit their work to the Salon jury. Also participating in the independent exhibitions were Paul Cézanne and Paul Gauguin, whose later styles grew out of their early work with the Impressionists. The last of the independent exhibitions in 1886 also saw the beginning of a new phase in avant-garde painting. By this time, few of the participants were working in a recognizably Impressionist manner. Most of the core members were developing new, individual styles that caused ruptures in the group’s tenuous unity. Pissarro promoted the participation of Georges Seurat and Paul Signac, in addition to adopting their new technique based on points of pure color, known as Neo-Impressionism. The young Gauguin was making forays into Primitivism. The nascent Symbolist Odilon Redon also contributed, though his style was unlike that of any other participant. 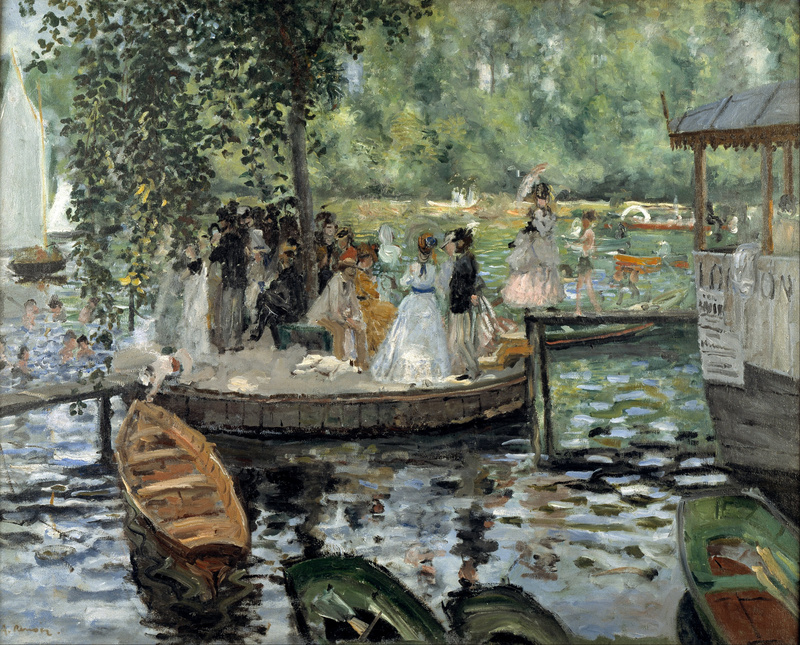 Because of the group’s stylistic and philosophical fragmentation, and because of the need for assured income, some of the core members such as Monet and Renoir exhibited in venues where their works were more likely to sell. Its many facets and varied participants make the Impressionist movement difficult to define. Indeed, its life seems as fleeting as the light effects it sought to capture. Even so, Impressionism was a movement of enduring consequence, as its embrace of modernity made it the springboard for later avant-garde art in Europe.